In the past two weeks (e.g. 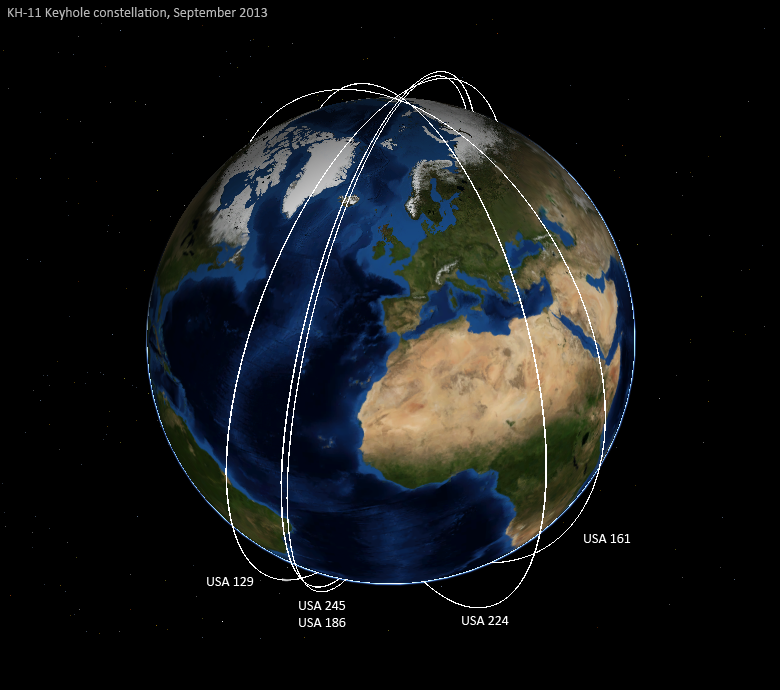 here, here and here) I have written about tracking USA 245 (2013-043A), the new KH-11 Keyhole (Evolved Enhanced CRYSTAL) optical reconnaissance satellite launched as NROL-65 on August 28. USA 245 has been launched in the same orbital plane as USA 186 (2005-042A), a KH-11 Keyhole launched on 19 October 2005. In time, it is therefore probably intended to replace this satellite. The diagram above (made with JSatTrak and using our amateur derived orbits for the two satellites) shows the orbital similarity between USA 186 and USA 245. The orbital plane is the same and the orbital altitudes are similar (and will probably be even more similar in the future, after more USA 245 orbital manoeuvering). USA 245 (white) is currently in a 262 x 1010 km, 97.87 degree inclined orbit. 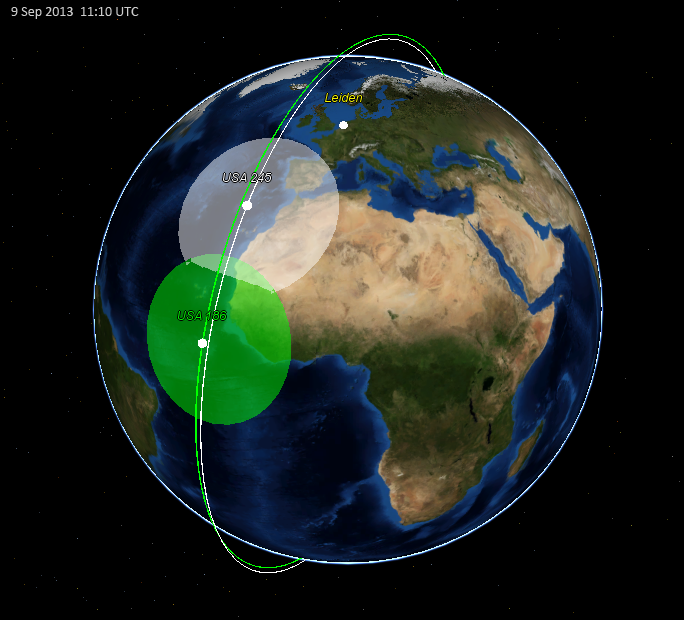 USA 186 (green) is in a 263 x 1017, 97.93 degree inclined orbit. These operate in two rather loose orbital planes. One, sometimes called the "West plane", produces passes in the local evening and morning, around 10 am and 9 pm local time. To this plane belong USA 129, USA 186 and the new USA 245. The other plane, sometimes called the "East plane", produces passes one to two hours after local noon and local midnight, around 1 am and 2 pm local time. This plane is occupied by USA 224 and USA 161. Of the Keyholes still in orbit and presumably operational (as they are periodically reboosted to maintain their operational configuration), USA 129, launched on 20 December 1996, has been on orbit for almost 17 years now. As can be seen in this table of data compiled by Ted Molczan, this is the longest operational lifetime of any of the KH-11 Keyholes so far. It will be interesting to see how long they will keep it flying: it's last predecessor, USA 116 (1995-066A), was de-orbitted on 19 October 2008. With the optical component of the FIA program cancelled, I suspect all of the remaining post-1996 Keyholes to remain operational for many years. For USA 129 though, the end should come one of these days, perhaps once USA 245 has been fully checked out and is put on operational status.